Combining old-style charm with modern day luxuries, The Gardens Hotel Key West is a charming and elegant boutique hotel that offers a relaxing, island-style getaway in the heart of Key West. Located just minutes away from the area’s top attractions, The Gardens Hotel Key West features 20 well-appointed and individually decorated guestrooms, suites and cottages, each of which features hand-crafted Bahamian plantation-style furnishings, marble bathrooms and modern amenities. Guests can relax at the hotel’s outdoor heated swimming pool or the self-service wine bar and can enjoy in-room or poolside massages and spa treatments. The Gardens Hotel Key West offers elegantly appointed and individually decorated guestrooms, suites, and cottages, each of which has private entrances, outdoor verandahs with gorgeous garden views, and luxurious hand-crafted Bahamian plantation-style furnishings. All accommodations feature polished oak hardwood floors and vibrant Caribbean décor, queen or king-size Hemingway beds with luxury Italian linens, custom duvets in bright tropical fabrics, and hypoallergenic pillows. En-suite marble bathrooms have walk-in showers, Jacuzzi tubs, thick towels, bathrobes, and organic bath products, and private balconies, patios, and verandahs overlook the Inn’s lush gardens. Modern conveniences in every room include Keurig coffee makers, refrigerators, flat-screen HDTVs with cable channels, air conditioning and Fanimation® ceiling fans, in-room safes, telephones, and complimentary wireless Internet. 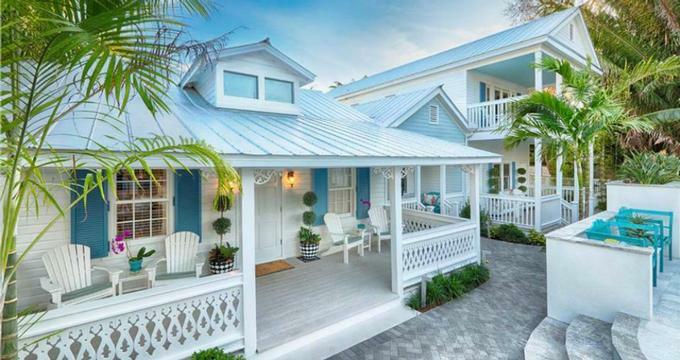 The newly completed Gardens Cottages at the Gardens Hotel Key West are located next to the Main House and offers extra levels of privacy, seclusion, and space. Surrounded by lushly landscaped grounds, four charming units have their own swimming pool and welcome pets and children. There is also a fifth stand alone cottage called the Eyebrow Cottage, which is ideal for honeymooners and couples wanting an intimate and romantic oasis. The Eyebrow Cottage offers a secluded setting a gated entrance and features vaulted ceilings, a luxurious bedroom with a king-size Hemingway bed with luxury Italian linens, custom duvet in bright tropical fabrics, and hypoallergenic pillows. A lavish en-suite marble bathroom has a walk-in shower, Jacuzzi tub, thick towels, spa bathrobes, and organic bath products and a private verandah opens onto the gardens. A delicious complimentary breakfast is served al fresco on the wide porch overlooking the gardens every morning and includes fresh fruits and juices, freshly baked bread, muffins and pastries from the local bakery, and hot coffee and tea. The Gardens Hotel Key West offers an array of exceptional amenities, including an outdoor heated swimming pool and pool bar (limited hours), the self-service d'Vine Wine Gallery, a complimentary island breakfast every morning, a fully equipped business center, and a selection of gourmet foods to purchase. Guests can rent bicycles to explore the area, enjoy in-room or poolside massages, and wander around the beautifully manicured gardens which feature fountains, tranquil ponds, and a bird aviary. Additional services include a valet laundry service, concierge services, and free wireless Internet access around the property. The Gardens Hotel offers a variety of unique deals and add-ons to enhance every stay, ranging from private dinners to bottle of champagne delivered to guest rooms. Edgy meets eccentric in a heady mix on the beautiful tropical island of Key West. Home to luxurious Caribbean villas, expensive art galleries, quirky literary festivals and an infamous nightlife, the southernmost frontier post of America offers something for everyone. Beautiful palm-fringed beaches and turquoise seas promise relaxation with an array of watersports to enjoy, while sprawling seaside mansions surrounded by manicured tropical gardens ooze opulence. The famous Duval Street is home to the most energetic strip of shops, bars and cafes in the country, while Ernest Hemingway fans shouldn’t miss a visit to the writer’s favorite hangout, Sloppy Joe’s Bar or the slightly more sober Ernest Hemingway Home and Museum. Adventure-lovers can take to the water on a fishing charter for prized game fish, or scuba dive to explore an ancient shipwreck on the ocean floor. Spend days lazing in a swinging hammock or visiting local art galleries and museums. Take a quiet stroll around the island to take in the interesting architecture, magnificent courtyards and gardens flush with moonflowers before heading into town to join the fray of frat boys, sorority girls and eclectic mix of artists, movie stars, and millionaires in this unique island oasis. The Gardens Hotel Key West offers a romantic and elegant location for destination weddings and other special celebrations. Ideal for small, intimate gatherings of up to 10 guests, the hotel features an enclosed tropical garden for memorable ceremonies and vow renewals.